Discussion in 'Land of the Rising Sun: ADV Bikes from Japan' started by PaD, Oct 26, 2017. I don’t think we will see a Versy-X 400 in the next 12 months. This thread is not my idea initially but I too think it is better to keep the Versys-X 300 thread as it is. Go ahead and post here, I enjoy the speculations about a VX400. I’d like to contribute more in this first post but, believe it or not, I have to work a little. The_Precious_Juice, cyclopathic and MBM like this. VX400 would be perfect for me aswell. If they could make and adv bike out of this engine then that would be even better. Let's wait and see, but good times ahead of us adv riders! There's a separate thread on Ninja 400 take a look. From what I can tell they've gone to engine as a stress member with BMW-boxer-eske like front/rear subframes attached to it. Having modular 3-piece design (front/rear subframes, rearset with swing arm pivot) should make adjustments easier to carry out. Perhaps front/rear subframes are reusable between Ninja and Versys X, so only the rearsets need to get updated. Question is if tank and plastic morning points are identical; if they are most of 300 will be carry-over. A Versys-X 400 probably comes closest to the modern 50hp adventure bike I've been looking for since I joined here. Dear Mr Honda, ever thought about a CRF450L? My brief flirtation with minimalism wasn't a great success - I need more oomph. Chris S, 11motos and The_Precious_Juice like this. So by the looks in this video, 250 Ninja also has new engine and frame design, so old 250/300 mill based products (yes Versys X 250/300) are out will be phased out next year. First page ADV rider mandatory "Needs to lose at least 50lbs, +10hp AT the same price before I'll buy it." Note the 50lbs, +10hp is half off the usual 100,+20 due to sub 500cc displacement. Eatmore Mudd, Grumblez, Eddieb and 5 others like this. "With all this talk about a 400X, I don't worry at all. It will be a minimum of two years before we see one in the US if ever. And as much fun as I am having with my newly acquired 300X, it will be worn out by then and ready to be upgraded / Traded in /sold /etc. It is only money and you can't take it with you. Stop worrying about something that has not happened and may not happen, and be Happy that we have the 300X to play in the dirt with. Now with that said GO RIDE." Some folks only have a small window to go on their once in a lifetime tour. It took Kawi 4 years to make the Ninja a platform ADV Bike. They could have been making money since 2014 on the X. Basically, zero competition then. I recommend to pull the trigger and go travel. My actual predication is 2020. The more X 300 they sale in 2018, the less likely they will go to the 400. Keep drinking from the well until she is dry. Think KLR. It's basically up to KTM and Yamaha to strong arm Kawi into making a X 400. The 313cc from BMW is more dirt like, so that will hurt sales more than folks waiting 15+ months for a 400. I had forgotten about the BMW G310GS... being a single cyl too. So there's a good chance Kawi will keep the VX300 around for at least a few years. I'd be fine with seeing a VX400 after that... give the 300 time to sell enough units and develop enough of a following, so the new one could be a refresh as well as just a new motor. Looks like 1 piece frame to me, front & back parts are connected at the engine near the intake. 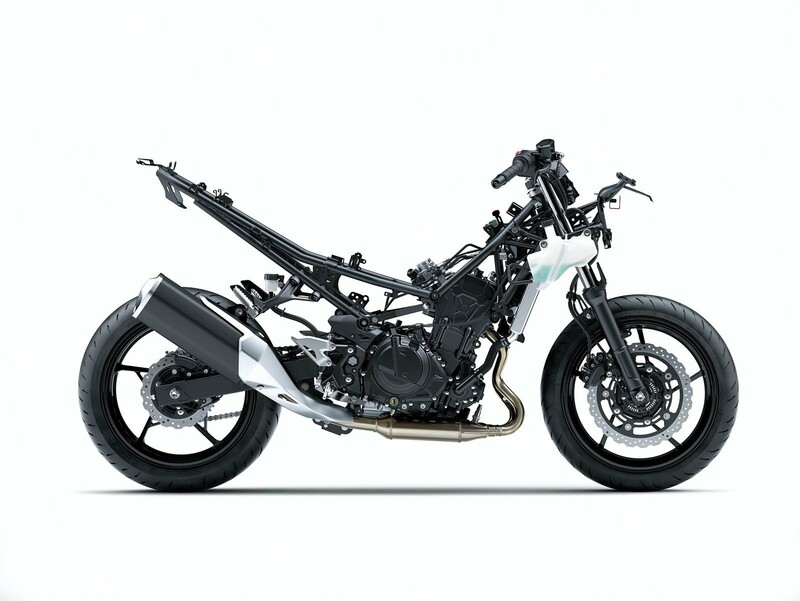 I suspect similar to the new ninja 650 frame it is also connected at the rear under the covers. The G310GS is about 34hp and 19 or 20 lbs of torque, but way more user friendly engine than the X 300. Max tac is 9,500hp. That is a busy thumper. The great thing about the GS is about 7" of travel amd Switchable ABS, and the low price. Hell of a local All-Rounder. The X 400 should be at about 400lbs cause you will need a more sturdy frame. One more reason for Kawi to wait until 2020 for the X 400 if they have to R and D a new frame. The Ninja 400 is 15lbs lighter and about half from fuel and wheels, right? The frame is lighter too now, right. I'm now wondering if KLRs need to be singles. An enduroish KLR400 with a 21" front wheel would suit me more. pennswoodsed, Howlinsage, Adanac rider and 3 others like this. Bike of the decade on ADV RIDER! This bike is going to be great, really great! It's the 28ftlb @ 8000rpm torque of the 400 motor, up from 18.9ftlb @ 10,000rpm on the VX300, that will make a big difference. Howlinsage, oceansfiftyseven, MBM and 1 other person like this. The 400 might come pretty close to delivering. PaydayGabe, k12rsrdr, IntrepidAdventurist and 1 other person like this. I have to say I'm not a big fan of the headlamp superstructure on bikes and I don't really need a windscreen. I've always had bikes with the light on the steering - I prefer that. But this new engine sounds very nice. I was impressed by the smoothness of the VX300 whizzing up through the gears. I guess the 400 has the red line at about 10,500rpm. The X 300 is showing up as a 2018 model. So is the KLR. Kawi Also updated their 250 Ninja. Its not showing up at all. The Ninja 300 is still a 2017. So, it looks very very bad for the Ninja 300 for 2019 at the latest. 1. Put the updated 250 in the current X frame. 2019 looks like hp is up to 39! Torqie is about 17.3 foot lbs! Mass is 167kgs or 368lbs. 2. Keep selling the X 300 until sells go down. ? I'm leaning toward the X 300 lasting until 2020. Granted, it's up to the competition to make this happen. Kawi should be Happy with the sells, thus far. So for 2018, the Ninja 300 is discontinued and replaced by the Ninja 400. The 400 will probably make its USA debut at the Long Beach IMS show this November. Since Kawasaki also made a brand new 250 engine (and new Ninja 250) to address the smaller displacement market, it seems like the old 300 motor is on the outs worldwide. My theory is the Versys-X 250 (in Asian markets) will be updated with the new 250 motor and the Versys-X 300 (rest of the world) will be updated with the new 400 motor. I think this will happen faster than we think because there's no reason to keep the old 300 motor around anymore. My guess is 2019.
hwy84, Adanac rider and The_Precious_Juice like this. Good point on how in many region's there is a Versys X 250, not 300. No reason to make three different engines that are similar in displacement. Below is a screenshoot from a studio video from Kawasaki.